Twenty years ago, Aston Martin unleashed the most extreme version of its V8 Vantage sportscar—the thundering 600 hp, twin-supercharged Vantage V600. Now, two decades on, the fast-growing British automaker is marking the end of production of the current Vantage—the so-called 'baby' Aston—by reviving the legendary V600 badge for an exclusive, limited run of just 14 Aston Martin V12 Vantage V600s. Aston Martin's Q personalization division will hand-build the cars—seven coupes and seven roadsters—which share much of the old-school character of the 1998 original. As with the original V600, the only transmission on offer is a stick. To reflect that '600' badging, the new V600 is endowed with an uprated 6-liter, naturally aspirated V-12 engine producing, you guessed, 600 hp—a 35 hp increase over the last V12 Vantage S.
It is mated to a seven-speed manual transmission featuring a racecar-inspired dogleg layout, with first gear to the left and down. The carbon-fiber body features a redesigned nose with a larger grille. Photo: Courtesy Aston Martin. What really sets this new V600 apart, however, is its unique styling. The full carbon-fiber body features a redesigned nose with a larger grille showcasing a new, wave-patterned honeycomb surface. 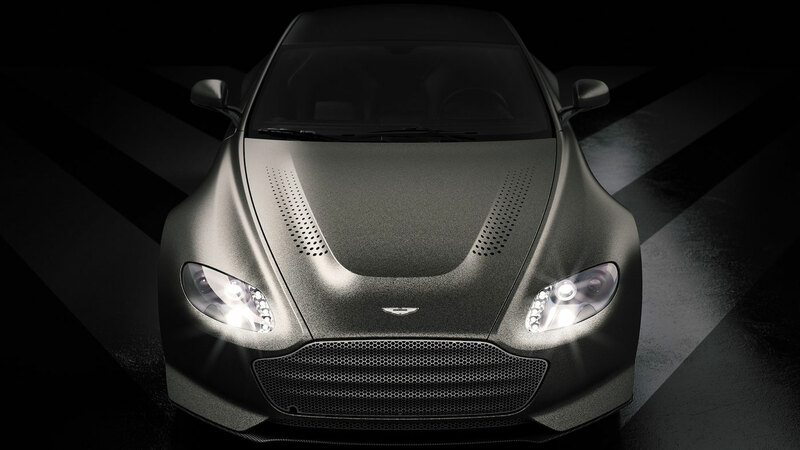 The hood design is also a real departure; it has a prodigious power bulge with hole-punch vents on each side, a design first seen on Daniel Craig's Aston DB10 from the 2015 Bond film Spectre. Along each flank, the Vantage's trademark razor-sharp side strakes are even more pronounced, and now emerge from vents in the front fenders. At the rear there's an all-new carbon diffuser and quartet of bigger-bore exhausts. New, center-lock forged and machined alloy rims further add to the visual drama of this low-slung two-door. 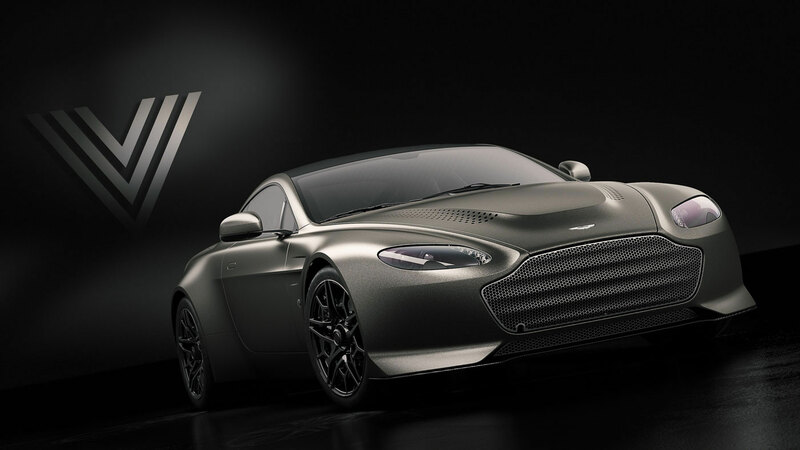 The hood design was first seen on the DB10 from the 2015 Bond film Spectre. Photo: Courtesy Aston Martin. If you like your interiors black, you'll love this new V600. Inside, the cabin is a sea of coal-noir carbon, hand-stitched black leather, and dusky anodized aluminum trim. One-piece, non-reclining race bucket seats and a chunky aluminum shift knob leave you in no doubt as to the car's performance credentials. Ensuring that each car is unique, Aston Martin says that the lucky 14 customers will be able to work with Aston’s design chief, Marek Reichman, to commission their car through its 'Q by Aston Martin' bespoke division. While there's no official word on pricing yet, expect the car to cost significantly more than the outgoing V12 Vantage S that it's based on. The latter had a base price of $186,195 for the Coupe version and $200,695 for the Roadster. The interior is decked in dark carbon complemented by hand-stitched black leather. Photo: Courtesy Aston Martin. The new car's extremely limited numbers, its V600 heritage, and the fact that these are the last of the VH-platform Vantages, should ensure the car's collectability and investment potential. Last year, Bonhams auction house sold a 1997 Vantage V600 Coupe for roughly $342,209. As for that original V600, it was actually a performance package offered to existing Vantage V8 owners back in 1998. Returning their car to Aston's Newport Pagnell factory saw the stock 5.3-liter V-8 uprated with twin superchargers to give a full 600 hp, accompanied by upgrades to cooling, exhaust system, and brakes. A total of 76 cars were eventually converted to V600 specification. Development work has already begun on this run of 14 new V600 examples, with the first cars expected to be delivered this fall.